"Chorizo Your Own Adventure Burger" in this one-of-a-kind edition of Monopoly! Buy, sell, and trade locations from Seymour's Bay, including Jimmy Pesto's Pizzeria, Wagstaff School, Beville's, and Wonder Wharf. Choose your favorite custom character token to travel around the board and relive your favorite moments from the show. 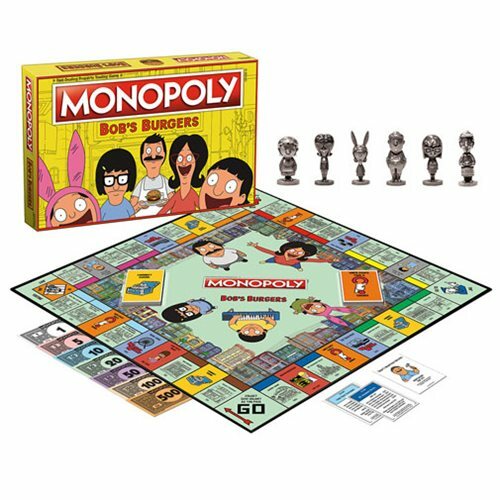 Grab your apron and get cookin' with the Bob's Burgers Monopoly Game! 2 to 6 players. Ages 8 and up. New Games for a New Year! Happy 2019!